"This is my first tournament for the year, I won it last year," "I'm not looking at it to defend it. I'm looking at obviously winning another title. "If I start looking at defending the title, I'll get nervous and I'm probably not going to defend it more than likely." 7th seed Marin Cilic had to come from a set down against Germany’s Jan-Lennard Struff to move in to the next round. Struff who reaxched three challenger finals last year produced good tennis throughout the close match by winning 77 points compared to Cilics 86. The croatian however regained control of the match with the help of 9 aces and converting 3/5 break points to finally win 36 63 63. 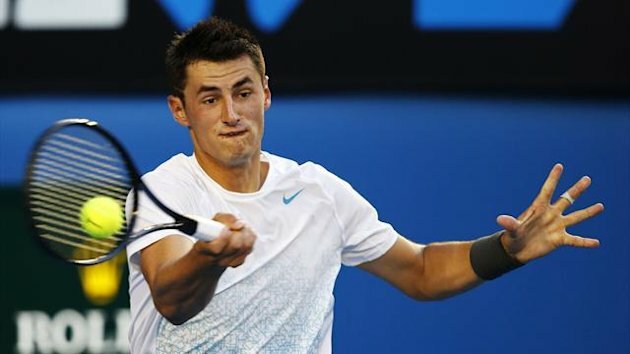 The only other seed to play today was Julien Benneteau who like tomic produced a convincing 62 62 win over Matthew Ebden. For full results from Sydney check out the results dection. "I don't know if it's everywhere, but in Germany we say it's always great if you win and you play bad. That's the good wins. "Because on the other hand maybe I sleep well tonight and I play a great match tomorrow." "In general you just have to win and I think that was also at the end, I just wanted to win, that's why I changed a little bit from the top swing to the slice, just to hope to look a little bit different from my opponent." Other wins included Roberto Bautista-Agut and Yen-Hsun Lu. The photos used in this blog is from numerouse sources but none are own by Tennisbanter.